Benefits of being an Owner Builder and the support you may need. How Landmark’s services and panelized homes help with your design, budget, control of the project and quality and pride of ownership. Building what you want and not being limited by standard plans. Understanding your new home project and getting the right help. Interviewer: Hey everybody and welcome to another episode of the Panelized Prefab Kit Home Building Show. I’m Stephen Savage, your host, and with me as always is my buddy Steve Tuma, President and Founder of Landmark Home and Land Company, a company which has been helping people build their new homes the way they wanted, where they want it, since 1993. Steve Landmark: It’s an excellent day. It’s a great day to talk about panelized homes too. Interviewer: Fantastic. Well, that’s what we’re here for and I thought today we would start off just getting right down to the brass tacks here. Are you ready for this one? Why build a Landmark panelized home? Steve Landmark: Well, it’s kind of interesting. A lot of people go, “Oh, you know, I just want to build a house. When I get the best price, I want to do this. I want to do that.” The reality is if you’re going to be an owner/builder, it’s nice to know what you’re doing instead of just, hey, have a house show up and take what’s given to you. It’s kind of a process where you can go through, you can design the house you want, make sure it fits on your land properly. You can control the quality of the home, control the features of the home and control the schedule of building it and also work on the budget. I think that’s the key element that our process of Landmark were to help people go through and understand what they’re doing, so they can get the best home possible. Panelized homes have been around a while. We’ve been doing it for about – since 1993 and it’s basically a more efficient method of stick-building a home. Stick-building meaning you get a bunch of two-by-fours, nail them together, make a wall, put a roof system up and kind of conventional building. So it’s a lot different than modular where kind of the two halves are brought out and sent together. Panelized, you can customize it, but it’s built in a controlled environment in a production facility, so that walls are square. Things are just built to better tolerances than if they’re done on site, in the weather in muddy fields. So it’s – that’s the key for the actual panelized product, but the whole designing and understanding and controlling your project and knowing what’s going into it. A lot of our people just want to see their house get built and they want to know that it’s built to a certain specification and when they have control of the project, they can know and verify it and know that it’s done right. It’s also a pride of ownership, pride of building. You did it and then the big kicker is the equity position that can be obtained. Why pay someone else for something you can do? You can lower the cost of your home, so it’s more affordable to you or you could put features into it that normally you wouldn’t be able to get in other building methods. Interviewer: Your website talks a lot about control. You’ve mentioned control here a couple of times. Control of the budget, the quality of the build, even control of the schedule and knowing what you’re getting. Kind of go through that step by step. How does Landmark help me control my project? Steve Landmark: Well basically through the building. First of all in the control is we can work with you to design the home you want. It’s not limited to 10 plans and hey, you should like this house and someone convincing you that you should build – that you should live in a house that they want to sell you. You can go through and say, “No, I want the kitchen a little bigger. I need a bigger garage. I like this look. I want a steep pitch. I want a porch in the back. You know, I want to do this and by the way, I want to build it in my land. I want to build it in Texas or Colorado or New York or California,” wherever it is someone chooses to build. So you’re able to spend money on what you choose to buy instead of being told what is good for you. So that’s the point. The quality, you can go through and determine what you want. If you want gold faucets and it works in your budget, put them in. If you’re someone that’s really into cooking and family get-togethers, you’re probably going to emphasize your kitchen a little more. If you’re someone that works on your own car, we’ve got a couple of customers restoring cars, having fun. They’re just car guys. They’re building their man-cave. That’s important to them. They can go through. We can make the garage big enough, so that their car lift goes in there. There’s a variety of situations, a lot of properties around recreational areas, lakes, mountains. So we can set things up. So you’re really increasing the bang for the buck that you’re getting because you’re getting what you choose to build and what you choose to spend your money on. Interviewer: Well, yeah, continue on that a little bit. Now I’m looking at a schedule. I’m looking at the website and it’s saying you can control your schedule. I would like to know a lot more about that because I think cost overruns a lot of times in home building just take the form of schedule was just too long or ran over or whatever. How do you help control that? Steve Landmark: Right. That’s something where we could work with a design and by having the proper set of plans, they can get approved by your building department. Those set of plans are then the key to communication in your subcontractors and the people involved in building your home, whether they’re designing cabinets or pouring a foundation or installing the electric. By that clean communication and understanding that our plans provide, people know what they can do. They know what it takes to do a job. They can show up, do their job and then move on, so that the next crew can come in. With that process, also with the panelized process, since the assembly is much quicker, than conventional stick building, we can work in areas that have a limited building season or if there’s rainy seasons and not just that. You want to get me your house. You want to take the time to build it properly. It’s not a race. But you do want to build it properly and you don’t want to have situations where it’s delayed or things like that. If you have a construction loan, the construction interest is ticking away. So you want to have control of the schedule, so you know what’s going. So our planning process, the panelization allows you to understand what’s going on but also control the process of actually building your home. A lot of people might call and say, “Hey, how much does this cost? How much does that cost?” and cost is important. But knowing what you’re getting and making sure it gets built right and the right schedule is just as important. Interviewer: You were talking about design and how – you were talking about man caves and garages and I would imagine that for some people, some home builders, this becomes even a family project because if you’ve got kids who are growing up, you want a house that’s kind of adaptable to them, to their kids as well and this just all seems interesting that these designs are so adaptable to every family’s individual needs. Steve Landmark: Well, that’s the key element. A lot of people ask us. It’s like, wow, you’ve been doing this since 1993. That’s a long time. They’re like, “Isn’t it just a job?” Like no, it’s fun. It’s important. When you see what a family can do – let me just take an example. We had a man that is retired and he plays in an orchestra. He designed in a music room into his house where he could practice his instruments, do those things. It’s a passion. So here’s a retired person that built a house that is now enhancing his life. We’re working with a family that I believe is going to start building with us in Colorado. The grandfather, the son and the grandson, they’re all out there working on their cars, restoring a hot rod, building this, doing that. Just to see that the families are working on getting the design. So it’s not just the process of hey, let’s get you a house. Let’s get you moved in. It’s look at what’s happening with it. Some people look at these projects as hey, I’ve got a young son and daughter. They need to know how to manage money. They need to know how to manage a crew. They need to have a starting point and an ending point with a goal. Then there’s a lot of people who do it just for the self-satisfaction. I want to know what I’m getting. I’m working hard for my money. I want to make sure I get the best house possible. I’m going to live here for 20 years. So there’s a lot of motivation as to how we do it and we support that. So if someone says, “Hey, I need to go through and redesign this kitchen a couple of times. It’s not quite there,” we will take that time. We actually worked with a lady and her husband, 78 years old. He always told her he’s going to get her a brand new home and at that time, he was ready to do it and able to do it. Apparently his wife cooks the most amazing pies in the planet. We designed a kitchen, so that it was perfect for her. So she could see him working in the yard with the grandkids and doing stuff. But she could still have the windows, the stoves, the refrigerators, the sinks so that she can bake pies. That was extremely important to that family. Interviewer: And that’s very specific. It’s great to be able to deliver that. Steve Landmark: Well, that’s the point about it. So instead of saying, “Hey, here’s a house. I hope you like it,” we get to say, “Hey, what do you want? What’s important to you?” If you’re into building a big garage, let’s do it. If you’re into cooking, let’s do it. If you need separate bedrooms and you have six kids, let’s do it. People have put slides in their house for their kids to slide down. You know what I mean? Steve Landmark: They put hot tubs in. They put different types of kitchens. They put different types of bathrooms, different types of showers and that’s the key – we’re helping one family do a house in an island off – in Washington State and they’re into kayaking. So they want to know that in their walk-out basement, they could get all their water sports equipment in and out. That’s why you work with us because we will take the time to design it, sort these details out and make sure it works, so that you understand what’s going on. This isn’t a situation of hey, we’re going to tell you the house you want. You’re going to tell us the house that you want. We’re going to work on the design, make sure structurally it’s sound, make sure it’s a good house. Then you move forward to build it. It’s your project. Interviewer: Kind of run us through why and how a panelized home is more cost-effective for me, the new home builder, as opposed to a traditional stick-built home. Steve Landmark: Well, I think the main thing is understanding of what you’re doing through our design process, the quality control and the specifications that we provide. Then along with the efficiencies of building, the speed of building and then tying the whole project together. It’s not real easy to say, “Hey, let’s go get an architect. Let’s go get a structural engineer. Let’s go do this,” and have all these people on the same page and then make sure it gets built right. There’s a lot of different details that have to be put together. So I think that’s the key element is the designing, the engineering, the delivery of the panelized home packages. I think the word is – you know, a couple of words, “one-stop shop”. That kind of helps make it easier for you to get things taken care of and that I think is a – is the important part. But I should emphasize the panels. I mean it’s a greener process because there’s limited waste. You’re not buying a bunch of materials and typically if there’s an eight-foot board and someone needs a two-foot board, they throw six feet away. In our process, in the production facility, that extra board is used someplace else. I think everything down to a two-inch board is reused in somewhere else in the home and then even the two-inch board is ground up and then it’s used for animal bedding in some of the agricultural areas around the plant. So it’s a green process and then just the nature of the design, the computer-controlled saws can figure out the best way to cut materials, so that there’s minimized waste. Panels are made on a flat jig, so that it’s a higher quality assembly. We deliver them on a flat bedrock directly to your building site. The assembly of the house package is more controlled. Quality of labor in general has gone down. So you can have a main-framing guy and two laborers, maybe three, that put the wall up. No one is out there doing build calculations and angles and this and that. We supply a very clear and accurate set of assembly plans that show where each component gets placed, where each wall panel goes, where each roof truss goes. So it’s not really a puzzle because we give you the answer and how to put it together. But it shows you how to go through. So it’s that control and understanding and the efficiency in building that allows our customers to retain control of their project and understand what’s going on. Interviewer: Now you had mentioned features earlier, things like gold faucets or countertops, things like that. How extensive is Landmark’s involvement with the overall design, but also those little personal touches? How much consultation do you guys put in on that? Steve Landmark: Well, this is the interesting thing because we generally get involved with the design, the structural engineering and the delivery of the panelized package. Our customer base appreciates being able to personalize their own home. So they want to spend their money on the home that they want and they want their family to be represented in there. So if someone wants expensive gold faucets, they can buy them. They could design it in. They can include it and that’s something that they typically would get locally. They could touch it, feel it, smell it, use it. Interviewer: That really gives everybody a hands-on feel to building the house. That’s great. I think that that’s very important. People don’t see the structure. We can take care of that to make sure the house is sound. But the personalization, hey, do you want carpet? Do you want tiled? Do you want hardwood? How are you going to trim around your windows? How is the kitchen going to be laid out? What kind of countertop? Those are those personal things that you’re going to run into every day and literally in some of these cases, it seems like the choices are limitless. That’s the key thing. So if people were to say, “Hey, I want a granite countertop with an island. You know, do a level island, so that when the family comes over, we can all sit around and watch a little TV, be by the kitchen. Everyone can hang out together,” we can design that and then they can determine the finishes that they want. So if that want a granite or Formica or cement or wood or whatever kind of countertops, we can design it right in there and work with them and the details. That’s the key element because this stuff doesn’t always cost more. It just takes a little bit of thought to say, “Hey, this is what I want,” and we could put it on the plans. Then they – our customers end up with more of a house. They end up with a house they want. Interviewer: I think the overall that I’m hearing throughout all these episodes of the Panelized Home Show is that Landmark Home and Land Company, the design and panelization process that you guys have come up with, it just seems that it makes it quicker and generally easier to take care of the tougher portions of building a new home and anything that the new home owner is going to come across, you guys seem to have that knowledge base to pretty much answer any question. Steve Landmark: Right, and that’s the situation. We kind of look at ourselves as an additional resource. So in the management of a project, there’s different people. There are excavators. There are foundation people. There are heating guys. We’re kind of the people developing the plan and the structure for the house. So we’re kind of like a right-hand man, an extra arm, an extra mind, so that someone could leverage their time and still go to work, still stay sane, still spend time with their family. You know, just do all these things and it’s very important to have a trusted, knowledgeable resource like Landmark, so that you know you’re getting taken care of. That I think is the key element of what people say about us is you took care of us. We got a testimonial. It was – you know, a lot of people, you would think you would say, “Hey, you got a great house. You showed up on time.” That’s great. But when they said, “And you care,” that was pretty heartwarming to us. So I think that’s the element there that we’re able to put together is listen to what you want and go through to work towards getting the house properly designed. So you build a house that makes sense for you. That’s the reason. Interviewer: We had mentioned a few times that you started your company in 1993 and when I think of 1993, I think, “Oh, yeah, 15 years ago or so.” In a few years, that’s going to be 30 years. Oh my god. Steve Landmark: Isn’t that wild? Yeah. Interviewer: It drives me nuts to think about that. But yeah, 30 – you’re close to 30 years in business. That’s pretty amazing. Steve Landmark: The coolest thing Steve is when someone from 20 years ago says, “Hey, you remember me?” and I said, “Oh, yeah. You built in Fairplay, Colorado,” and they say, “My son wants to do one.” We’ve actually worked with families where we’ve helped every adult in the family build a house. Some families will come back every couple of years and build a house. Some families will recommend us to someone 10 years down the road. You hear about that and that’s the ultimate pat on the back of, “Hey, good job.” That’s what we’re about. It’s helping you. But we know when we help someone, that when their friend calls up, we know we did our job. Interviewer: Well, we’re about out of time for this episode. If you wouldn’t mind Steve, can you give us the contact info for Landmark Home and Land Company? Steve Landmark: I would say give a call at 800-830-9788 and then our website at www.LHLC.com. That’s basically the initials of the Landmark Home Land Company. It’s actually Landmark Home and Land Company. But the letters for the website are L as in “land,” H as in “home” – or sorry, L as in “Landmark,” H as in “home,” L as in “land,” C as in “company,” dot com, www.LHLC.com. 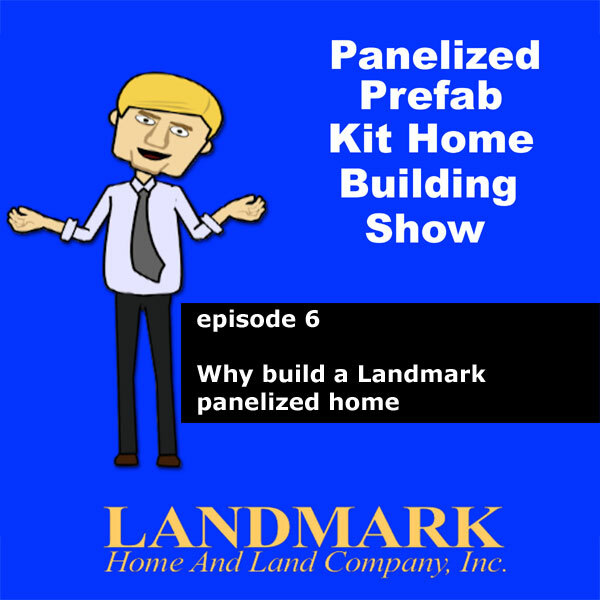 Interviewer: Well, once again, it has been a real pleasure and I want to thank everybody for tuning in to the Panelized Prefab Kit Home Building Show and we will see you next time.